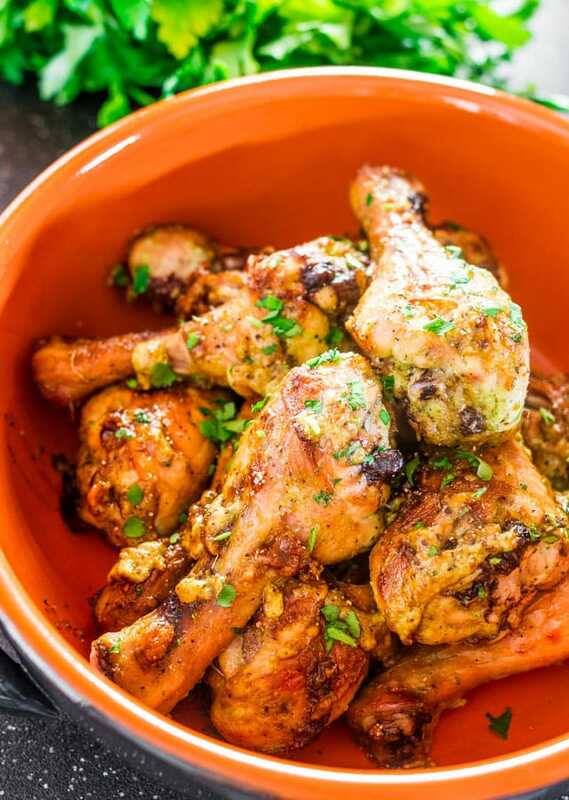 HoBaked Garlic and Ginger Chicken Drumsticks – marinated chicken drumsticks in a delicious garlic, ginger and soy sauce marinade, easy and delicious supper. Like many of you I struggle constantly with what to make for dinner. It’s such a chore, especially for a busy weeknight. Having a food blog I think about food constantly. I dream about food, I live food, which is probably a good thing that I love food so much. Nevertheless, it’s still a struggle especially since hubs is so picky. So many times I’ll make something and he’s not interested, I have to beg him to try it and then he falls in love with it. But you’d think that after 13 years of marriage he’d learn and trust me from the get go. Ah NO! We have to go through the same song and dance routine every single time! 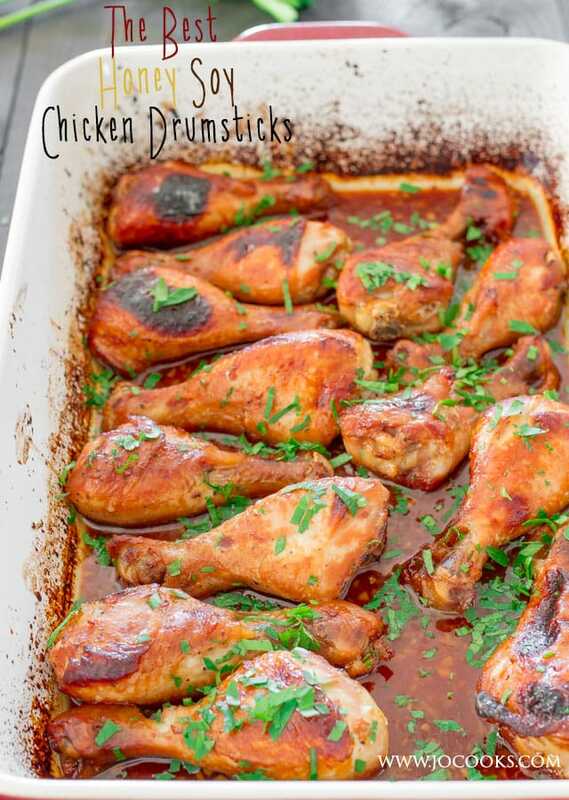 One thing I can never go wrong with though, is chicken drumsticks. It’s a favorite of his, and of mine. Another favorite is garlic, I absolutely love garlic and I probably use a lot more garlic in my dishes than most people do. When a recipe calls for 2 cloves of garlic I’ll use 5 cloves. I just love the flavor of garlic, and it’s supposedly good for you. Win. Win. But one thing that goes great with garlic is ginger. My tip for ginger is this. I don’t use ginger often, so when I buy some fresh ginger, I put it in a ziploc bag and freeze it. When I need it, I just take it and grate a bit for what I need, no need to thaw it out or anything, it grates just as easy frozen. This way I always have ginger on hand. Sometimes I may buy the ginger and garlic paste little jars and they are very handy when a recipe calls for ginger and garlic. However in this recipe I used the fresh stuff only because I used a lot of garlic and a lot of ginger. I made a marinade with lots of garlic and ginger, some soy sauce, olive oil and parsley. It was to die for! A simple marinade but with lots of bold flavors. 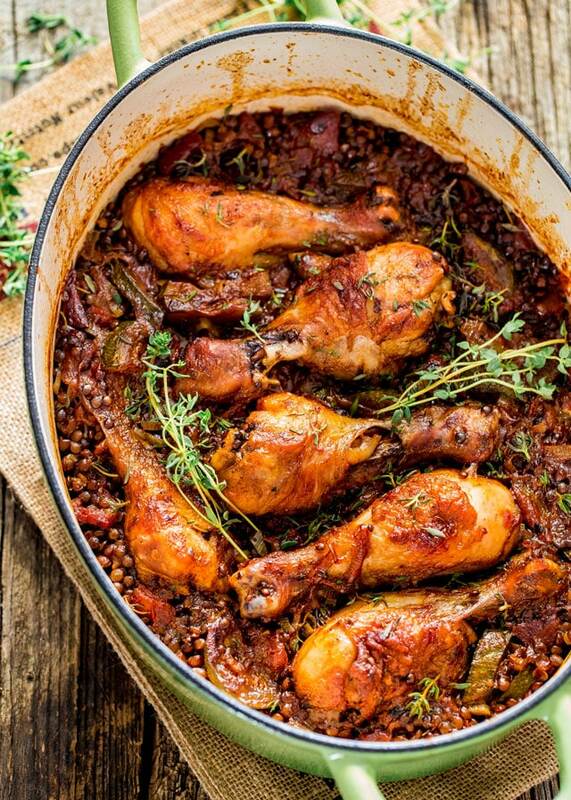 You only need to marinate this for about 20 to 30 minutes, though you could marinate it overnight and have it ready for next day when you come home from work, just bake it in the oven and you’ll have real nice juicy and tender chicken. 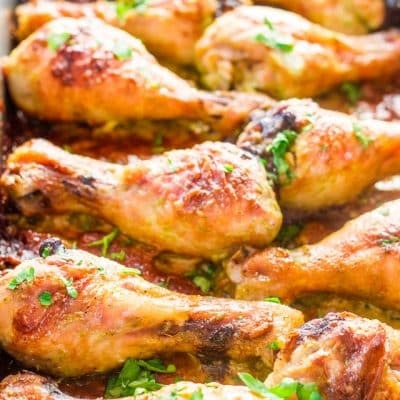 Baked Garlic and Ginger Chicken Drumsticks - marinated chicken drumsticks in a delicious garlic, ginger and soy sauce marinade, easy and delicious supper. Add all ingredients (drumsticks excluded) to a blender or a magic bullet and pulse a few times until garlic and ginger are a paste and the mixture emulsifies. 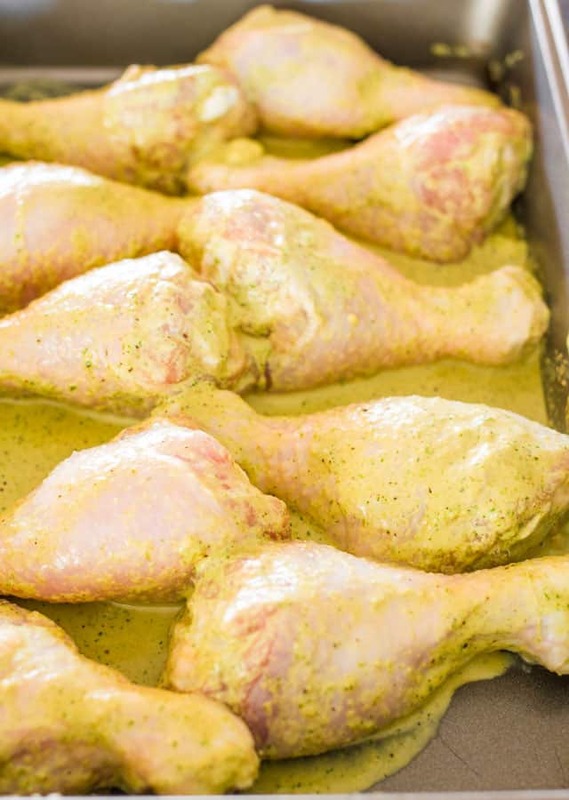 Place the drumsticks in a large ziploc bag and pour the marinade over the chicken. Close the bag and place in fridge; let it marinade for about 20 or 30 minutes. Could be marinated overnight. Place the chicken and all of the marinade in a 9x13 inch baking pan. Bake for about 45 minutes or until chicken is cooked through and browned on the outside. 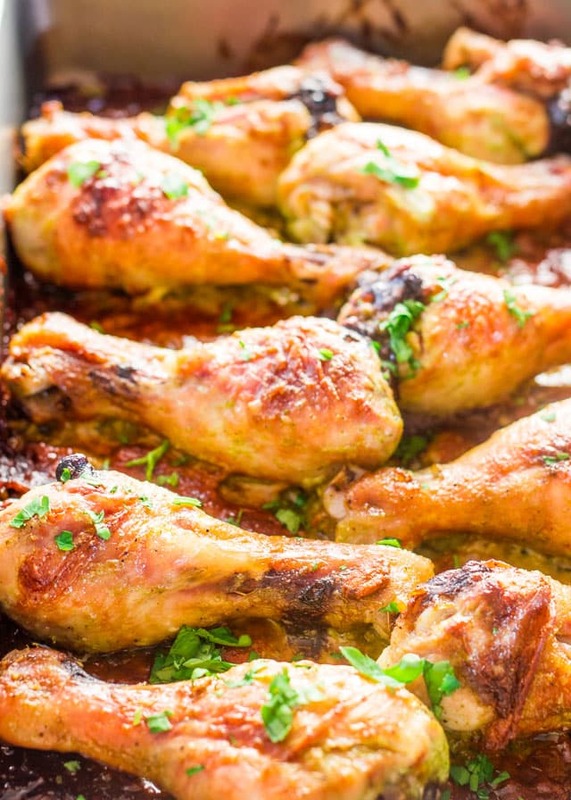 Serve these drumsticks with a side of mashed potatoes, or rosemary roasted potatoes and brussel sprouts. Not a comment but a question. What is your opinion of making slash marks or punctures on meat that will.marinate for several hours? It’s a great method for infusing some more flavor into the meat! I would use that method for chicken, thick cuts of pork, and roasts, but not for steaks. I tried this recipe and my marinade was much more greener than yours shown on the picture so was my chicken. I followed exactly the amounts. Different ingredients during different seasons can create slightly different outcomes. As long as it’s tasty, you’re good! If i use the ginger garlic paste from a jar, how much would i need to use? I would use 2.5 tbsp! This is my third time using this recipe. .my kids love it and I love the simplicity. Thanks so much! My pleasure, so glad you like it! What side dishes would you serve with this? Thanks for making baking so simple! We loved it! I did not have so sauce at home …so used lemon juice and the was awesome …. 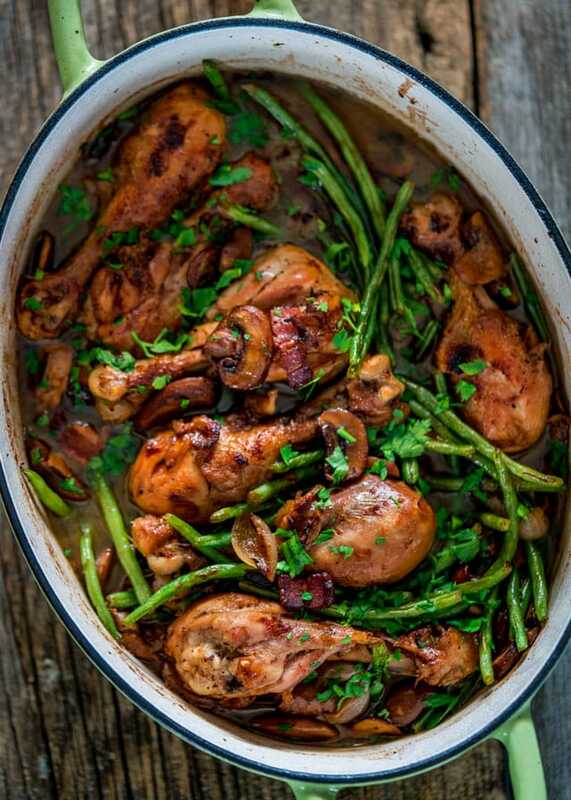 loved the flavor of parsley and garlic! Shall keep trying more from this site! Thank you! No I don’t, not necessary. We loved this chicken! Followed recipe and only was able to marinate for 1 hour and it was so good,will make again and put in fridge overnight. I have been married for 47 years and I have never seen him go up to pan and lick the spoon LoL he loved it that much!Thanks for all these great recipes. Can you pan fry this as well?